Sturgis, SD – The annual Sturgis Buffalo Chip’s® Biker Belles, presented by Harley Davidson®, will be bolstered this year by a generous auction donation from famed artist, David Uhl. 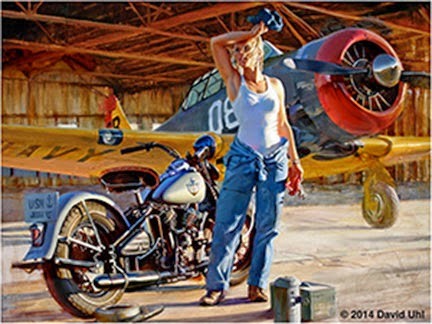 Uhl’s painting, “Jessi,” is one of the most popular of his "Women of Harley" series and is valued at $4,850. In addition to the auction, the Biker Belles symposium. “Ride On,” will feature a superstar lineup of industry panelists including filmmaker, Michelle Carpenter, who will open the symposium with a clip from her new documentary about women riders, “Driven to Ride.” Andie Gaskins, Cat Hammes, Audrey Nesbitt, Diva Amy Skaling, Kathy Tolleson and others will also serve on the panel. role women play in shaping the culture, sport, art and history of motorcycling. The Lodge at Deadwood will roll out the red carpet for the Biker Belles kick-off. Riders will register, pick up their t-shirt and get ready for a special luncheon and symposium beginning at 11 a.m. Guests of the ride will gain inspiration and have the opportunity to meet such honorary guests as Gloria Struck and Cookie Crum. Participants may also visit The Comfort Zone by Team Diva to discover and experience new beauty care, fashion ware and ride gear made specifically for women riders. Safety expert, Vicki Roberts-Sanfelipo, will serve as the 2014 Biker Belles ride captain. At 3 p.m. she will guide riders, including industry leaders, Jessi Combs, Laura Klock, Christine Sommer-Simmons and Kristy Swanson, through the canyons of the Black Hills. The ride will lead its participants to a special catered reception, fashion show featuring Harley-Davidson MotorClothes® and auction at the Sturgis Buffalo Chip’s Russ Brown Event Center beginning at 5 p.m. Iron Cowgirl Missy will provide live musical entertainment throughout the reception. The ride and auction is meant to help broaden the message of support for women in motorcycling. Bids for the print are now being accepted online at BuffaloChip.com. The online auction will close at 1 p.m. on Aug. 5. Auction proceeds support Biker Belle charities, the Sturgis Motorcycle Museum & Hall of Fame and Helping with Horsepower. Helping with Horsepower is a program that uses contributions to help abused and at-risk young women and girls. The Sturgis Motorcycle Museum is world-class facility that uses the contributions to expand or enhance exhibits featuring women riders. All—men and women—are welcome to join the Biker Belles Ride, symposium, luncheon and Buffalo Chip reception. Riders are asked to make a $45 contribution to join the ride and festivities, 100% of which will directly benefit two South Dakota charities.